Located in the neighborhood area, Lose It With Laser proudly offer you our top service: Microdermabrasion Burwood. Our clinic is a gorgeous place for professional beauty treatments. We are more than happy to offer you our team full of professional yet friendly therapists. You know that you are in good hands because they are highly experienced in laser therapy. So try our service today and make a difference to yourself. Our up-to-date technology uses fine diamond crystals to remove the dead outer skin layers. The technique ensures to stimulate circulation and blood flow which results in collagen and elastin production. In simple words, we will refine and rejuvenate your skin by polishing away dull, lifeless skin cells. After that, you will experience a completely fresh, radiant and youthful complexion skin. Normally, we would recommend 4 to 6 treatments for optimal results. However, each treatment only takes around 10-30 minutes and require no recovery time. During the treatment, we also exfoliate your skin, which promotes a brighter, more youthful appearance. Advanced technologies: Our treatments are always delivered by up-to-date equipment. 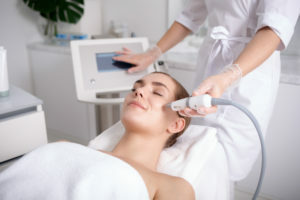 Cutting-edge non-surgical rejuvenation technique: We always upgrade not only our technology but also our therapists’ skills to ensure you have the best treatments. Positive feedback: We are constantly receiving positive feedback from our beloved customers. It truly gets results! If you are looking for a gentle, non-surgical and chemical free solution to freshen up your skin, Microdermabrasion is the one. So indulging yourself today with our Microdermabrasion Burwood service. All you need to do is sit back, relax and leave the rest to us. Call us now to make an appointment with our skin professionals.